Upper Body Workouts That Deliver Results! Upper body workouts are necessary to the overall development of body muscles. In fact it is essential that every muscle group is developed in order to achieve a well-shaped body. The upper body is composed of the muscles of the arms, shoulders, chest and back. If you want to achieve lasting results you need to add your upper body workouts to your overall weight training routine at least twice a week. The different muscle groups of the upper body should be given much concentration with all weight training programs if the goal is to gain muscle mass verses just muscle tone. Upper body workouts require some basic knowledge on proper nutrition as well. Not just any diet plan, but those designed for body building. It is important to eat more than before, but it also has to be the right combination of foods, especially those rich in protein. Usually, a dietitian will require more proteins and carbohydrates for the first three months. This will pump up the muscle mass, but will not yet ensure proper shape. The next months after that will require eating fewer carbohydrates and fat, but more proteins to provide proper muscle definition or shape. For the arms, do some barbell bicep curls, concentration curls, close grip bench press, and triceps cable extension. Barbell bicep curls is the most essential exercise for the biceps. Make sure that the body is straight and unmoving during this exercise. Use dumbbells for concentration curls. This particular exercise helps improve the shape of the biceps. For the triceps cable extension, you will be using a cable to extend this particular muscle group. This is an excellent exercise for shaping the muscles. The close grip bench press is also a good exercise. It may be hard, but it provides a lot of benefits for the triceps. For the shoulders, do some barbell rear delt rows and barbell incline shoulder raises. Barbell rear delt rows are necessary for the enhancement of the muscles on the rear shoulders. The barbell incline shoulder raise is best for the overall shaping of the shoulder muscles. All of these upper body workouts should do miracles for the arms and shoulders. The best upper body workouts for the chest include the bench press and the decline/incline bench press. These exercises ensure the proper shaping of the chest. If you do not perform them during your normal upper body workouts routine, then do not be surprised not to have bigger chest muscles. The decline/incline bench press is best to do with dumbbells for variation. The best upper body workouts for the back include variations of the row, pull-ups and cable pull-downs. Rows can be done with the help of a barbell, dumbbells, cables, or the T-bar. Pull-ups and pull-downs may also be performed for variation. For the lower back, do some hyper extensions. All these upper body workouts mentioned should best be performed in 3-4 routines. Find All The Equipment You For Complete Upper Body Workouts Below! 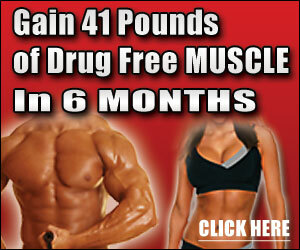 Weight Training Programs And Health And Fitness Products Everything You Need To Get In The Best Shape Of Your Life! | Upper Body Workouts Never Leave Them Out Of Your Weight Training Routine!